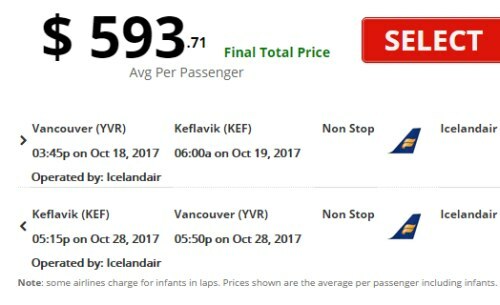 Icelandair has dropped the price of their non-stop flights from Vancouver to Reykjavik, Iceland down to $572 CAD roundtrip including taxes for off-season travel between late October 2017 and May 2018. Apr 25 to May 1, 3, 6 -- new! Apr 27 to May 1, 3, 6 -- new! Apr 30 to May 8, 10, 13, 15 -- new! May 2 to May 8, 10, 13, 15 -- new! May 4 to May 8, 10, 13, 15 -- new! May 11 to May 15, 17 -- new! May 11 to May 20 -- new! Update 5/17 - Some dates for travel a little earlier in October 2017 have become available. Update 6/3 - April 2018 dates have become available. Update 7/6 - Late April to early May dates have become available for $572 CAD roundtrip including taxes. 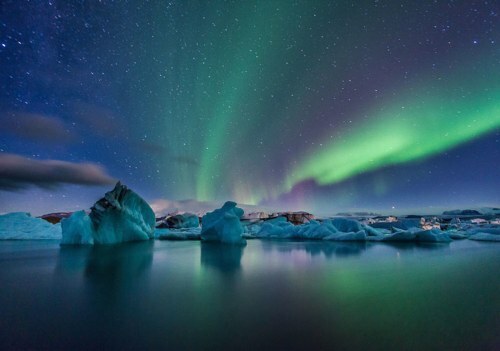 3 Responses to "Vancouver to Reykjavik, Iceland - $572 to $594 CAD roundtrip including taxes | off-season travel, non-stop flights"
Just came back from one week in Iceland. It's a beautiful country and I highly urge people to go there (although it is getting crowded with tourists). Just be prepared for it to be VERY expensive over there and the flights end up being the smallest expense of your trip. I booked Japan this year, China next year, and just now Iceland also for next year to celebrate half way through my program. Thanks Chris! Without you I would forever spend a fortune on airfare. Love love love. Cheers! Thanks Jules, that is definitely appreciated. I'm glad it helps, have a great time on all those trips!